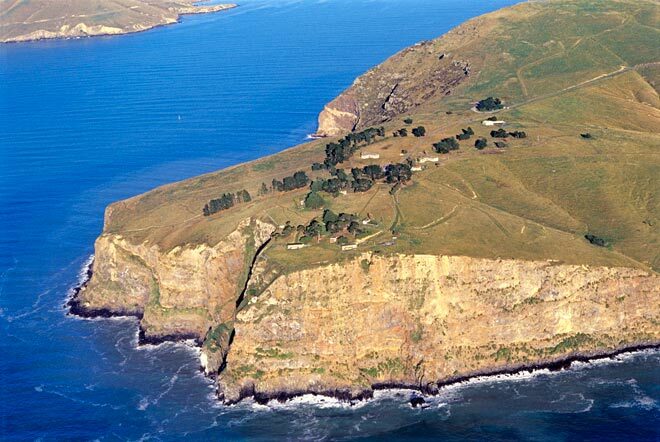 This aerial view of Godley Head, at the entrance to Lyttelton Harbour, shows the extent of the defence battery which had been built in 1939 to defend Christchurch and the port from possible attack from the air. The site had originally been used for a lighthouse, but the light was moved and by the time the defences were complete there were 110 structures and over 400 people living and working there. The site has been restored and three large anti-aircraft gun emplacements are visible, along with a number of military buildings. The June 2011 earthquakes damaged the site and it was closed, but was expected to re-open.